I hope you are having a wonderful Christmas! Our household of two has expanded to 13 for a week of Holiday Festivities (Christmas plus two birthdays thrown in, the 23rd and the 24th.) We have family from Massachusetts, Colorado, and Texas enjoying our snow-covered home. 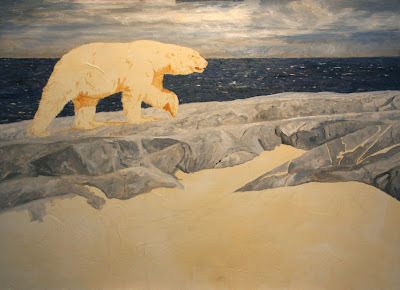 In the past couple days, I have had a chance to get in a few hours on my polar bear piece. 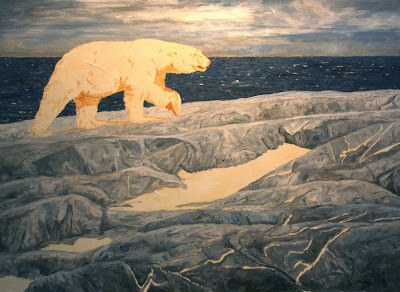 The rocks still need more work but I am moving on to some of the shadows with the bear. Once the darker areas are roughed in, I will paint the "white" fur and then head back to the rocks. The Early Stage. In this case, the "Ugly Stage." Every artist who has a good number of paintings under his belt has been here. It can be in the middle of the painting, near the beginning or on the cusp of completion. Often I know which pieces will have an Ugly Stage. (I knew the rocks were going to be an issue.) It is then I recognize that I need to power through this section and work on the painting even when I don't feel like it. How did I know the rocks would be a sticky point for me? Well, having a Master of Science degree in geology can have its disadvantages. These Canadian Shield rocks are intermediate banded Precambrian gneisses. They have to look like intermediate banded Precambrian gneisses. Maybe most might not know these grayish brown lumps are intermediate banded Precambrian gneisses, but I do. At this point, the rocks are a little too blue and need to have more texture and character. (This photo of the painting does make them look a bit bluer than I have painted them.) I think my best way to accomplish the subtlety of color I envision is to do some glazing with Liquin once this stage is dry. Sometimes just when you think you are done with a painting something nags at you. 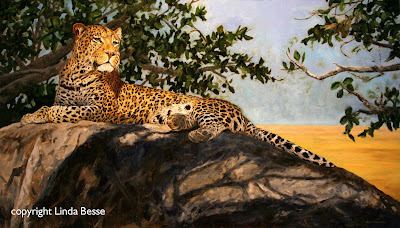 For me it was this leopard's belly. It didn't feel right. So I phoned my artist friend Victoria Wilson-Schultz to get her take on it. She agreed. I needed to change the belly. With some prompting I also got her to say she felt the sharp yellow horizon line a bit distracting. Thank you Vikki! Here is Prime Spot with the changes I felt it needed (smaller belly, darker chest, lighter left paw against the chest, slightly darker neck left side of the painting, softer horizon line and a few changes which are too hard to see at this scale). You can also see the fur detail I added after my post of Dec 6th. Getting another artist's take on a piece or setting a painting aside for a couple days can give you a whole new perspective. 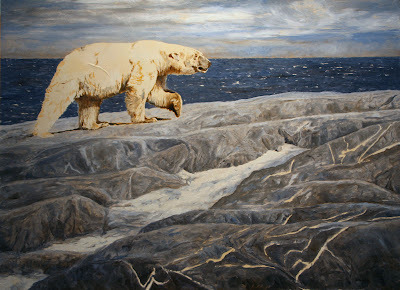 It is difficult to paint something out, revise, or add elements when you have worked hard on a piece. But all that hard work is for naught if you don't listen to that inner voice whispering (or screaming) for you to make alterations. Is this now a successful painting? Who knows. But, I think it is a better painting because of the changes. Pacfic Flyway Gallery & Framing is having their Gallery Holiday Open House and GRAND OPENING in their new location at 409 South Dishman-Mica Rd, Spokane Valley, Washington. I am honored to be Featured Artist for this event. Pacific Flyway is showing 24 of my originals and a number of my canvas giclee prints. Not only does this gallery carry original art, but it is also a Mill Pond and Greenwich dealer and has the most extensive collection of framing samples anywhere in the Inland Northwest. No matter my subject matter, I can find the perfect frame with the help of owner Holly Swanson. Drop by, have a bite, and take a look at this 26 year old Gallery in their expanded new location. 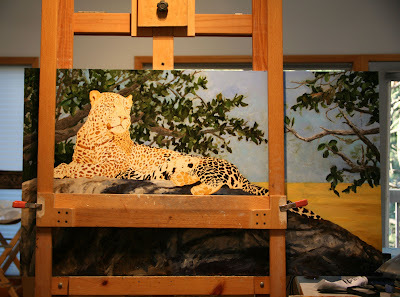 I forgot to take some more in progress photos as I worked on the leopard. I was on a roll. Left to paint are his right front paw, his two back feet, his belly, and his whiskers. To the rock I have added a few lighter spots. I may make some changes to the right background but I will wait until the leopard is finished before I revisit that area. 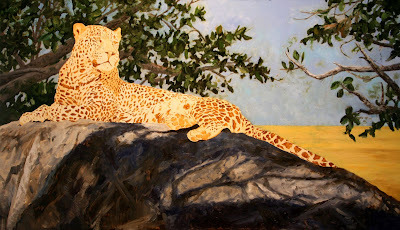 While I have spent time fooling with the background, the painting's success really comes down to the rock and the leopard. I wanted the fig tree shadows on the rock to have some purple and blue tones. I thought they would nicely compliment the colors of the leopard. With the rock blocked in, I will move on to the cat. For the spots, I have reattached my vertical bars so I can use my handrest. On a large piece like this, the bars can be confining when I am trying to do large spaces, like the background or the rock, but they are essential when I am working in middle of a painting surrounded by wet paint.